Lilian attends to student issues including academics, housing, excursions, and social activities with our partner universities. Before joining CEA, Lilian taught for more than 20 years at various levels of elementary school, high school, and higher education. She has also participated in international programs for students from Germany and the U.S., including student exchange programs and volunteer work in Chile. 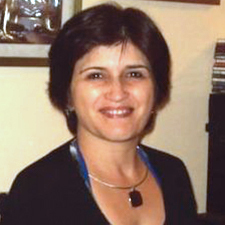 Lilian holds a Bachelor of Arts degree in ESOL from Pontifical Catholic University – Valparaiso. She is a Teacher of English as a Second Language and has a bachelor’s degree in English Literature. Lilian has traveled to the U.S. and across England as a group leader of a Teen Summer Program, aimed to provide insight into British culture. During the exchange program, the group took part in cultural visits, spent time at Woking & Brooklands College, and stayed with host families in Addlestone, Southport, and Worcester. Lilian would love to visit Italy’s historic and artistic monuments and views. But she would love to travel with all of her family, because any place is much better when traveling with the people you love the most. Her best advice for study abroad students is to take full advantage of the program, to immerse in the culture as quickly as possible, to get in touch with a lot of local people, to “forget” about home for a while, and to participate in all the activities available.